July 25, 2014 (LONDON, UNITED KINGDOM) – As ABS-CBN’s The Filipino Channel (TFC) celebrates its 20th anniversary and as the Philippine Centre marks its 30th, the two industry movers presented the biggest ensemble of stars and the grandest showcase of Filipino talent at the “2014 Barrio Fiesta sa London” last July 19 and 20 at the Apps Court Farm near Hampton Court Palace in London, United Kingdom (UK). From its humble beginnings as a picnic in Holland Park in London, Philippine Centre’s “Barrio Fiesta sa London” has become the most anticipated Filipino gathering in UK and, together with TFC, has drawn record crowds throughout the years by providing a world-class Filipino entertainment platform and a dazzling display of Filipino culture and tradition. Galing ng Filipino, Ituloy Mo! Joining in the singing was ABS-CBN Corporation President and Chief Operating Officer Charo Santos – Concio who even moved along Valenciano’s dance tunes. Santos was joined by other ABS-CBN executives including Star Cinema Managing Director Malou Santos and ABS-CBN Regional News Bureau Chief Danny Buenafe. Also joining Valenciano for the two-day fiesta and hosting the event is Pokwang, who could relate to Valenciano’s song as she used to be an overseas Filipino herself before she became a comedienne and a household name. Pokwang surprised the crowd by role-playing as Darna and Supergirl the next day. From one teleserye hit to another, Jessy Mendiola reprised her role as “Maria Mercedes” in one sizzling number. Sam Milby raised the shriek decibel level with his acoustic number and band medley. Enchong Dee wowed the crowd with a boy band medley complete with costume changes for each number. The Philippine Centre headed by hermano mayor Joseph Parinas has been organizing the “Barrio Fiesta” in partnership with TFC in Europe, headed by Garcia, since 2010 to bring together all Filipinos and Filipinos-at-heart in UK and nearby countries, for a two-day event that replicates the elements of a Philippine fiesta, as its name connotes. Aside from the celebrity showcase, the “Barrio Fiesta sa London” also offered Filipino activities such as games and promos and treats, including meet and greets and a food fiesta. 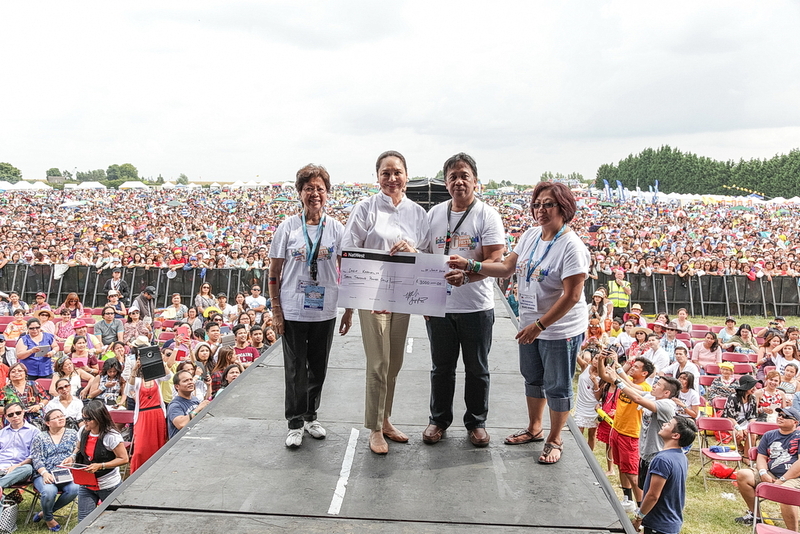 Showing that the event not only offers fun but also funds to Filipino causes, the Philippine Centre turned over to Charo Santos-Concio a donation of GBP3,000 for ABS-CBN Foundation’s Sagip Kapamilya, a program dedicated to relief operations during calamities and rehabilitation projects.